Hello and welcome to my website. You’ll see below some of my songs, performed both by Akron’s Chuck Auerbach Band and by my friends in a loose group headed up by Michael and Kathy Grady (Grady and Grady). I’ve included lyrics below each performed song and there are additional ones under the lyrics popdown. Songwriters and Musicians: If you're interested in creating your own songs using these or other Chuck Auerbach lyrics, check back as we continue to add more of my material. The current crop are all listed in the Lyrics section of the menu. Contact sheet below. We’ll be posting a version of Chuck’s new song Ace of Fools closer to the time of the Soup and Song event scheduled for January 18th in Akron. Check back soon. Meanwhile…happy holidays to all! So here we are in November, and I got asked to play an opener at that old Akron standby, Annabell’s at Highland Square. My old friends Grady and Grady joined me and came up with this ditty for the song ‘That Guy on the Corner.’ Lyrics follow the video. Just spent a grand evening in Akron about protest. Guess many of us were in the mood to share our frustrations via song. Here’s me performing a new song with Grady/Miller at Jilly’s Music Room in Akron. It’s called ‘The Stranger.’ Lyrics below the video. "Red Sails" and "Relaxation": an oddly glowing (and charming) review of my album "Remember Me," from a blues magazine in the Netherlands. I'm not fixing the Google translation! Text: Peter Marinus (in Dutch). It has become an album with wonderfully relaxed music with influences from the blues and the country. An album that you would like to put on during our hot summer. In the wonderfully languid Sylvie the obvious JJ Cale influences can be heard. That sound hangs over the entire album. Chuck has a soft, fragile voice that fits perfectly with this music. The languid accordion and the sparkling guitar work also stand out. Chinaman is a lazy shuffle with a warm humming bass and brightly piercing guitar. The song is reminiscent of "Red Sails In The Sunset". Desperation is a sultry bluesy shuffle with hard organ licks and twang guitar. A song with a threatening and desolate sound. The Long Time To Be Lonely ballad is pretty soulful with a wonderful tingling piano and crying pedal stem. As beautiful and relaxed is the ballad I'm So Sorry with Chuck's intimate whispering vocals and the languid accompaniment. If You Left Me is a heaving song with a early 60s rhythm & blues sound, complete with warm floating organ and deep twang guitar. Not only Ian Dury wrote a song about his father. Chuck also has one, My Old Man . A very fragile ballad. In Bottoms Up , the JJ Cale sound is mixed with nicely surging rockabilly with piercing country guitar. Finally, the booming slow blues shuffle Some Fools passes by with hard angled guitar riffs. Father Auerbach and his son have delivered a wonderfully relaxed album, which will certainly appeal to the fans of JJ Cale." Here's "Bottoms Up," about hypocrisy, not religion, and is one of my favorite songs that the band plays. Lyrics below it. Enjoy. Cathy Grady, member of my Akron live band, takes a Chuck song and turns it into a country soul masterpiece. It's called "Time After Time." Here's a nice ditty worked up around a song I wrote, called simply "Jenny." With lyrics. Thanks to my Akron live band for the hand! Here's a song worked up by my Akron live band, with lyrics, called "It's Only Words," which I wrote fairly recently. We played it at our show in May. Enjoy! Meet the band! Chuck introduces his awesome Akron live band at the Jilly's show, May 2018. 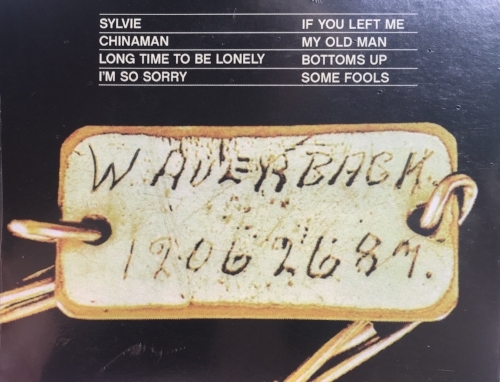 Here's the live version and lyrics of the song "Chinaman," as recorded with Chuck's band in Akron (arranged by Dan at his Easy Eye Sound for the album Remember Me). Enjoy! "The Lonely Hour" is the first new song and lyric we're going to load from Chuck's 5.30.18 set at Jilly's Music Room in Akron. Remember Me dropped today, 6.15.18! Chuck's finely crafted and heartfelt lyrics were brought to life in 9 songs produced and arranged by his son, Dan Auerbach, at Easy Eye Sound in Nashville. One of them, "My Old Man" (showcased below), is a very personal ode to Chuck's own father Walter. Happy Father's Day indeed. Chuck has many more lyrics "waiting for a song". The musicians in his Akron band added some more to the mix and were filmed live. We'll start adding them to the site soon, above. Musicians can contact Chuck about creating music around any of his lyrics on the info page below. Musicians have free reign to create in any song genre. Lyrics from the album have been marked as such, others will be added over time under the lyrics pop-down. The cover art features the bracelet his father, and American GI, gave to his mother in England in 1943, when he left for Eastern Europe. "My Old Man" features vintage photos of the family. Despite raising a Grammy-winning musician, Chuck Auerbach had never put much thought into making a career out of music himself. The elder Auerbach didn’t make his on-stage performance debut until age 66, but he has been honing his lyricist craft for years. His first album, Remember Me, showcases his innate ability to convey the stories of his well-lived life through song lyrics. The album of nine songs, which will be released on June 15th to coincide with Father’s Day, was a collaborative effort with his son Dan Auerbach, who also produced the record, and features some of Nashville’s finest musicians, including Dan, Kenny Vaughan and Dave Roe. As the son of an immigrant and a first generation American, a strong work ethic was engrained in Chuck from a young age. His father instilled in him both the importance of providing for one’s family and his love of jazz. Chuck also quickly immersed himself in rock and roll, which shaped his musical style. After his son burst into the music scene in the early 2000’s with his band The Black Keys, Chuck’s love for music resurfaced once again. He and Dan began writing together, earning him songwriting credits on Thickfreakness and Keep It Hid. As a local of Akron, Ohio, he immersed himself in the music scene there, singing his originals acapella at open mic events, which resulted in several local bands performing his songs. In 2014, when he began working with Kenny Vaughan in Nashville, he was encouraged to perform his own songs and that captured his energies. Chuck collaborated with Dan, Kenny and musician Corey Chisel in Nashville, to record the album he had spent years crafting and which he named "Remember Me." Within a few weeks, and with the help of A-list musicians, the entire album was completed at the Butcher Shoppe and it was mixed and released with additional musicians - Russ Pahl and Richard Swift - at Dan’s Easy Eye Sound Studio. Now at the age of 68, Chuck Auerbach is finally ready to step into the spotlight, age aside.